How much patience do users have for slow applications? According to a new study, it depends on your age. According to the 2015 Desktop Experience Study sponsored by virtualization company AppSense suggests that Millennials are by far the largest age group (28 per cent) to say they are “always” distracted during a slow logon or app boot-up. This is in contrast to 16 per cent of Gen X and 6 per cent of Baby Boomers. 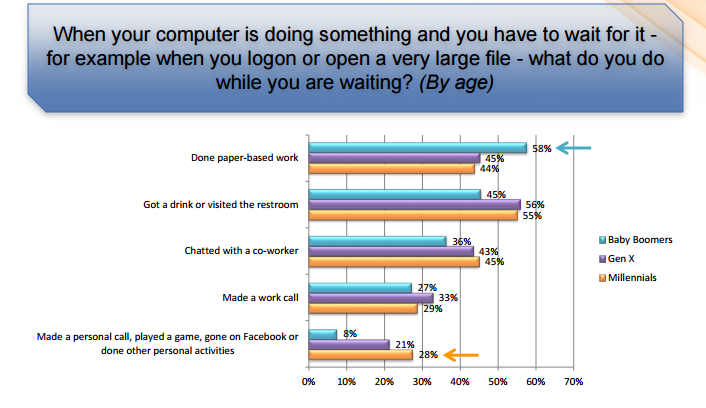 The study defines slow as lasting longer than 30 seconds for a logon. Meanwhile, the study also reveals that, when distracted, Millennials are most likely to turn to non-work-related activities such as social media (28 per cent) versus their older peers (Gen X at 21 per cent and Boomers at 8 per cent). Regardless of age, however, distractions tend to last between one and five minutes for half of all business users while for 38 per cent, it can last even longer. According to Jed Ayres, senior vice president of marketing at AppSense, it’s the workplace that needs to catch up. According to the study, just over half (56 per cent) of Millennials feel they have access to a desktop experience that allows them to be very productive. Gen X and Boomers are relatively higher, at 64 an 73 per cent. “Close attention to a better desktop experience can deliver compelling benefits for employee retention and loyalty,” Ayres said.